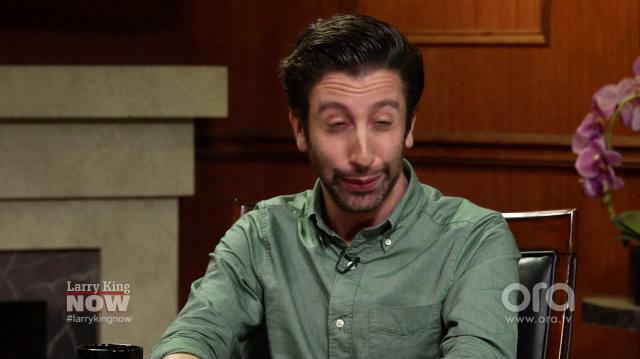 After he stole the show with his impersonations during his 2014 'Larry King Now' appearance, Simon Helberg dazzles Larry once again with a second round of Nic Cage, Al Pacino and Billy Baldwin imitations! Helberg: You already got the viral! King: But I, let's- let me hear that, because you even look like Nic Cage. Helberg: Well, you know, yeah. Nic Cage, you know, it's a pleasure to be here. Larry, you know, I have some suspenders but they're actually made of alpaca fur and they go great with my, uh, my pterodactyl pants. Prehistoric outfit, very rare. King: You do look like him, you got him down. How about my friend, Al. Helberg: Well, Al, you know, he's just, uh, always happy to be talking. Doesn't really know where the sentences are going to end. King: Do you do other imitations? King: Anyone you do that we might introduce here tonight? King: Who are you working on? Helberg: Who am I working on? You know, I'll have to come back - you know,I don't want too many things to go viral and first one, second. King: OK, but there must be someone else. Helberg: Yeah. Who else do I do, um. Well, there's a good- I can do Billy Baldwin's face, but I can't do how he talks. But, he's got this face. King: That's Billy Baldwin. That's right, you can do his face, work on me, maybe you can do me. Helberg: Yeah well, next time. I got the suspenders under my shirt, I just wasn't prepared for the question.